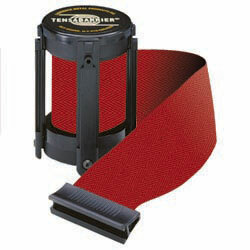 This 4-way tensabarrier replacement belt, 13-foot maroon polyester web line barrier accessory, is intended for use with Tensabarrier brand stanchions only. 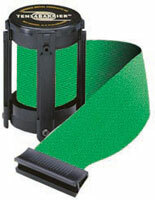 Each extra-long retractable queue pole cartridge is designed to need only a standard phillips head screwdriver for installation. The Tensabarrier brand replacement belt 13-foot maroon retractable line accessory is an ideal way to update, lengthen or replace worn or dated crowd control barriers. 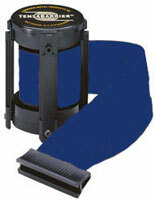 The sturdy woven polyester fabric is 2" tall to create effective high visibility barriers wherever needed. The retractable cartridge, replacement belt in 13-foot maroon webbing comes in a full selection of colors in both standard and extra-long lengths.